The 34-year-old rapper-actor admitted he would like to collaborate with Jay-Z, but joked that they may never perform together on stage because of Jay-Z's popularity. "I wanna work with Jay-Z one day. I'm a big fan," he said. "But you know, a lot of times you can find yourself doing collaborations with artists and the more big time they are, the harder it is to track them down to come out on stage to do a song with you, even though you did a video together. So you end up on stage by yourself." He added: "So a lot of the time, I just like doing my own song because then I don't have to look for somebody to come out from behind the curtain!" 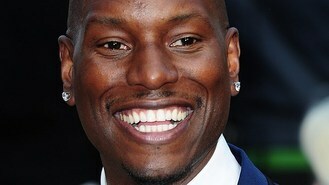 Tyrese revealed he has been working on a record with fellow music artists Ginuwine and Tank. "My album won't be coming until next year, around July 2014, but there is an album I am working on now with Ginuwine and Tank, called TGT. We've all been solo our whole careers and now we're doing an album together. It's coming out this summer," he said. Tyrese has reprised his role as street racer Roman Pearce alongside Vin Diesel, Paul Walker and Christopher 'Ludacris' Bridges in Fast And Furious 6, which opens in cinemas on May 17. "This one has way more action than the previous, and the chemistry with the cast is amazing because we are really a family on and off camera," he continued. "We were working on a movie we felt everybody was waiting on, and that really inspired us to work hard on it. We hope we don't let the fans down."